 Simple Design: Mini Portable Fan is made of sturdy all-metal, injury-prevention frame, 3 thin rotating blades and other inner parts. Lightweight but durable. Adopt brushless motor, without noise. USB cable charge for convenient use. 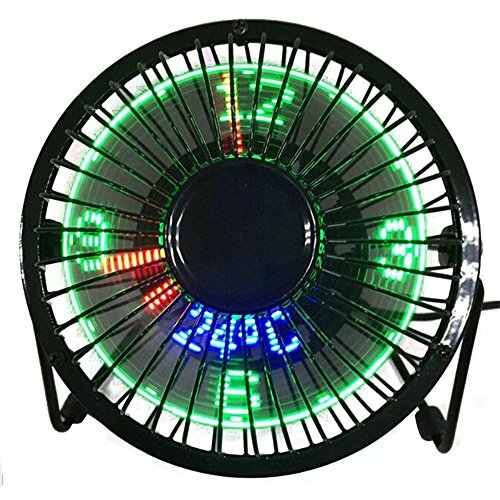  Time Display: Real LED time and temperature display function for you better to know the time and temperature. Memory function allows to keep displaying the right time even if the USB plug is removed, no need to set again.  USB Powered: Equipped with a USB cable for power support. Compatible with computers, laptops, portable chargers and other devices with USB output, which allows to use the fan anytime in the office, home, library, etc.  Two-speed Control: On/Off switch with 2 speed settings, which can provide powerful wind while mute operation, ultra-quiet. 360 degree rotation design, you can turn it upwards and downwards to adjust the you want angle.